Winning The Price Is Right: Strategies for Contestants’ Row, Plinko, and the Showcase Showdown. Slate’s complete guide to better bidding through game theory—you don’t even need to know the prices. Bob Barker speaks to the studio audience during his last taping of The Price is Right, on June 6, 2007, in Los Angeles. On a crisp November day eight years ago, I took the only sick day of my four years of high school. I was laid up with an awful fever, and annoyed that I was missing geometry class, which at the time was the highlight of my day. I flipped on the television in the hope of finding some distraction from my woes, but what I found only made me more upset: A contestant named Margie who was in the process of completely bungling her six chances of making it out of Contestants' Row on The Price is Right. Many contestants fail to win anything on The Price is Right, of course. But as I watched the venerable game show that morning, it quickly became clear to me that most contestants haven't thought through the structure of the game they’re so excited to be playing. It didn't bother me that Margie didn’t know how much a stainless steel oven range costs; that's a relatively obscure fact. It bothered me, as a budding mathematician, that she failed to use basic game theory to help her advance. If she’d applied a few principles of game theory—the science of decision-making used by economists and generals—she could have planted a big kiss on Bob Barker’s cheek, and maybe have gone home with … a new car! Instead, she went home empty-handed. In the Contestants' Row segment of the show, four lucky people who have been plucked from the audience are asked one by one to guess the price of an item. The contestant whose guess is closest to the actual price, without overbidding, wins the prize and progresses to the more lucrative pricing games where tens of thousands of dollars can be won. If Margie had applied a few principles of game theory, she could have planted a big kiss on Bob Barker’s cheek, and maybe have gone home with … a new car! In one instance, when Margie was the last contestant to bid, she guessed the retail price of an oven was $1,150. There had already been one bid for $1,200 and another for $1,050. She therefore could only win if the actual price was between $1,150 and $1,200. Since she was the last to bid, she could have guessed $1051, expanding her range by almost $100 (any price from $1051 to $1199 would have made her a winner), with no downside. What she really should have done, however, is bid $1,201. Game theory says that when you are last to bid, you should bid one dollar more than the highest bidder. You obviously won’t win every time, but in the last 1,500 Contestants' Rows to have aired, had final bidders committed to this strategy, they would have won 54 percent of the time. Instead, last bidders too often rely on their intuition, or on suggestions called out by delirious audience members. As a result, they have won only 35 percent of the time. Contestants in this sample of 1,500 who guessed a value between the highest and second-highest current guesses, as Margie did, win only 20 percent of the time. In this instance, the oven cost $1,999. Margie lost again. To help future contestants avoid Margie’s fate, I decided to make a handy cheat sheet explaining how to win The Price Is Right—not just the Contestants' Row segment, but all of its many pricing games. This guide, which conveniently fits on the front and back of an 8.5-by-11-inch piece of paper, does not rely on the prices of items. That may sound crazy, but there's good reason behind it. Cataloging all the possible items up for bid—from karaoke machines to Reese's Peanut Butter Cups—would be impossible, and even if you could, prices change frequently. For example, in the most recent season of Price Is Right, the Honda Accord LX was valued in different games as $22,587, $22,480 (twice), $22,934, $22,423, $22,791, and $22,841. In six of the seven times it appeared, the exact value was needed in order to win it. Memorizing prices ahead of time—even if you had a hunch you might have a shot at that Honda—has less value than you think. Follow the right strategies, and this could be you. Game theory, by contrast, can increase your chances of success even if you’ve never set foot in a Honda showroom. Had Margie been able to stumble her way to one of the pricing games, game theory would have been even more useful to her. Consider the game Now or Then. Contestants are asked to guess whether each of six small prizes, numbered 1–6 and placed in a circle, is labeled with the current NOW price or a THEN price from an earlier date. If the contestant guesses correctly on any three consecutive items, she wins a prize, like a digital piano or a trip to Savannah. Avid Price fans know that four items are always NOW and two are always THEN. Over the last 13 years, contestants have averaged a 68 percent win probability. They have largely done so by trying to accurately discern the NOW prices from the THEN prices, but this is the wrong way to approach the game. Given the limited combinations of NOW and THEN in the six slots, this game is no more complicated than tic-tac-toe and can be won 100 percent of the time, regardless of the contestant’s knowledge of Gold Bond body lotion prices in 1998. Below is the complete decision tree, so you can be assured of fulfilling your lifelong dream of winning a $6,000 digital piano. NOW and THEN is hardly the only contest where game theory can greatly increase your chances. Many others can be cracked with a bit of knowledge of the show's (nonrandom) habits. Consider the pricing game called Squeeze Play. Current host Drew Carey shows the contestant either a five- or six-digit number and asks the player to remove one digit from the number—first and last digit excluded—to reveal the price of a prize. Over the last eight years, this game has been played 215 times with a five-digit number, meaning the contestant can either remove the second, third, or fourth digit. If every contestant had gone into the game opting to pick the third digit, regardless of the prize or the numbers displayed, the combined contestant winning percentage would have been 49.8 percent. Instead, players got wrapped up in guessing the exact price—and had a combined winning percentage of just 35.8 percent. The reason that it's better to always pick digit No. 3 in Squeeze Play is that the show’s producers are clearly not placing the numbers randomly. The wrong digit was placed in the third slot 49 percent of the time as compared with 22 percent and 28 percent for the second and fourth, respectively. The discrepancy between the winning digit's location and what we would expect if that digit were placed randomly is statistically significant—meaning the placement is not, actually, random. Whether the show's producers are intentionally favoring the middle location, or are doing so simply because they’ve failed to simulate randomness, is unclear. What is clear is that guessing the middle digit is the safest bet in Squeeze Play. This isn’t a knock on The Price is Right. The show makes no promises of behaving like a casino, with perfectly random distribution of numbers. And its nonrandom habits are great for the contestant—and presumably for the show, which doesn’t want to feature an endless parade of losers. There is a game called 2 For the Price of 1, where each digit in the price of a three-figure item must be guessed correctly. For every digit, contestants choose between two numbers, one placed above it on a top row or one below it on a bottom row. If the game were truly random, the correct digits should come from the same row (either all from the top or all from the bottom) one-in-four times. In the context of the game, however, these two instances occur less than a combined one-tenth of the time. Because these TOP-TOP-TOP and BOTTOM-BOTTOM-BOTTOM instances are so rare—and because one number is always revealed to the contestant at the beginning of the game—victory is relatively easy to achieve. Winning 2 For the Price of 1 is like counting cards in a three-card deck. Should you spin the Big Wheel a second time? Depends on what you got in your first spin and whether you're the first, second, or third contestant to spin it. -The first contestant should spin again if he has 65¢ or less. -The second contestant should spin again if he is a) behind player one, b) ahead of player one but has less than 50¢, or c) is tied with player one but has less than 65¢. -The final contestant (who has the benefit of knowing all the previous players’ actions) needs to spin again if he is not in the lead or is tied with one of the other contestants with a score of less than 50¢. (If the contestant has more than 50¢ and is in a tie, he is better off pressing his luck in the one-spin tiebreaker. 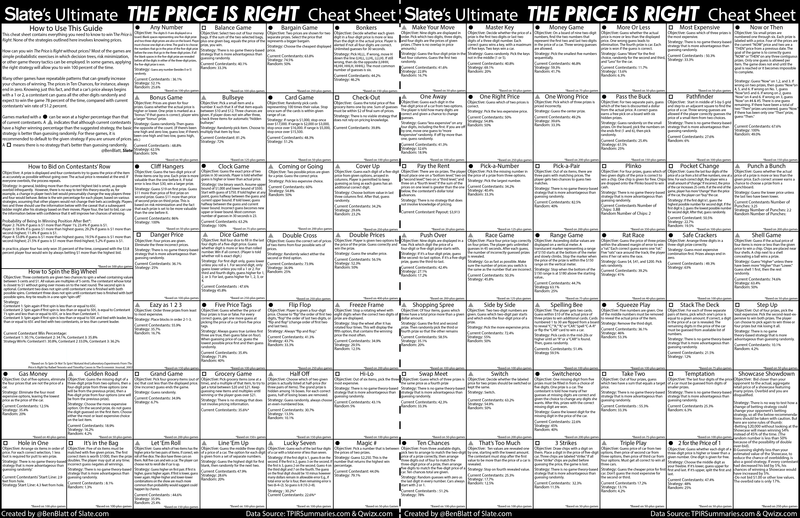 My cheat sheet offers advice for all 71 current pricing games. In order for a pattern, such as the one discovered in Squeeze Play, to be noted on the chart, it had to be statistically significant. The data used to reach all conclusions in the chart was gathered from tpirstats.com and episode transcripts from qwizx.com. I am indebted to the people who run these sites and have devoted their free time over many years to record this data. Their absurd work made my absurd work possible. The next time you’re under the weather, or just playing hooky, come on down to Slate and use this guide to play along at home and see if you fare better than the Price Is Right contestants. And if you’re on your way to CBS Television City studio, print out this guide on a piece of paper, or on a T-shirt, for easy reference. It could be the difference between coming home with a new dinette set or suffering the sad fate of Margie. Click here for a printable version of the Price Is Right cheat sheet.